Indian Masalas are globally known for its aroma and flavour. Masala is a common homely name in India for any special mix of spices. 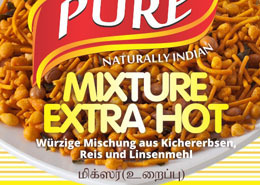 But the interesting factor in Indian cooking is that there is a special masala mix for each dish which makes Indian cuisine unique and savoury. 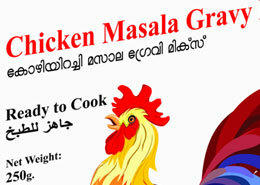 Saras Chicken Masala gravy is a special homemade recipe processed in a natural way without any additives. This gives your dish a homemade taste and thick in stature. The product is passed through a strict quality control conforming to International standards. Saras ensures high quality in all the ingredients used in all their products. All these masalas are made medium spicy to match any kitchen. Ingredients:Onion, Tomato, Yogurt, Coconut, Red chili, Sugar, Refined flour, Ginger, Garlic, Salt, Cashewnut, Fennel, Turmeric, Cardamom, Cinnamon, Cloves. Indian curries are globally known for its aroma and flavour. Masala is a common homely name in India for any special mix of spices. 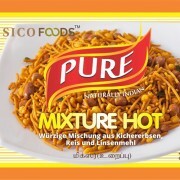 But the interesting factor in Indian cooking is that there is a special masala mix for each dish which makes Indian cuisine unique and savoury. 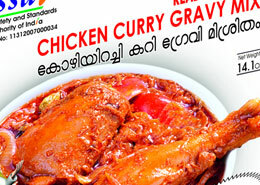 Saras Chicken curry gravy is a special homemade recipe processed in a natural way without any additives. This gives your curry a homemade taste. The product is passed through a strict quality control conforming to International standards. Saras ensures high quality in all the ingredients used in all their products. All these masalas are made medium spicy to match any kitchen. Ingredients: Onion, Tomato, Refined Vegetable Oil, Coriander, Green chilli, Red chilli, Cashew nut, Salt, Ginger, Garlic, Coriander leaves, Fennel, Turmeric, Pepper, Cinnamon, Mustard, Cloves, Cardamom. A unique blend of high quality Indian Nilgiri Tea freshly packed in attractive pet jars to maintain the aroma and freshness. 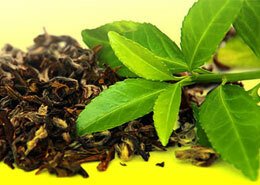 The tea is sourced from selected farms in the Nilgiris to ensure a uniform aroma and quality. A traditional Indian crunchy flat snack made out of a special mixture of Gram flour and Rice flour mix added with chilly powder, asafoetida, salt and curry leaves fried in vegetable oil. Its a suitable snack for any occasion. A traditional Indian crunchy flat snack made out of a mixture of Gram flour and Rice flour mix added with chilly powder, asafoetida, salt and curry leaves fried in vegetable oil. Its a suitable snack for any occasion. 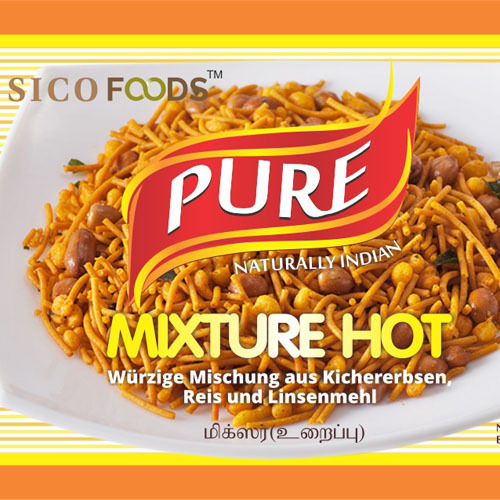 An Indian crunchy snack to go with any occasion like tea time or Cocktails.The base is made gram flour mixed with lentil flour and rice flour fried noodles added to fried rice flakes and roasted green peas and nuts. 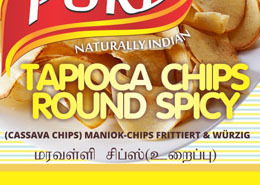 Turmeric, chilly powder, asafoetida and salt are added to taste.Its a medium spicy snack most suitable for your cocktail evenings. 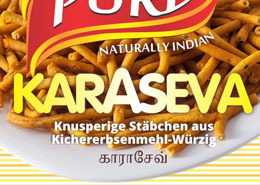 A popular Indian homely snack to go with any occasion like tea time or Cocktails.The base is made gram flour mixed with lentil flour and rice flour fried noodles added to fried rice flakes and roasted green peas and nuts. Turmeric, chilly powder, asafoetida and salt are added to taste. Its a hot and spicy snack most suitable for your cocktail evenings. Jack fruit is a common fruit in Kerala, Southern State of India.Its being used to cook and preserve in many ways. 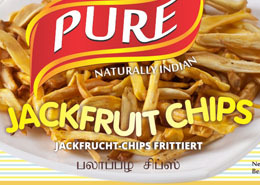 Jack fruit chips is a delicious Indian crunchy snack freshly cut and fried in vegetable oil added with turmeric powder and salt. No preservatives added. 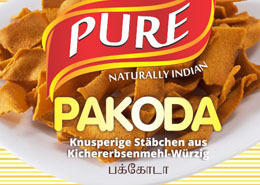 A favorite Indian crunchy wafer snack brought out from the best quality tapioca (Cassava) grown in Kerala, a Southern State of India. Tapioca is sliced in wafer size, fried in vegetable oil with chilly powder and salt. Fried curry leaves are spread to give a rich flavor. This is anytime snack and suitable for cocktails. No preservatives. 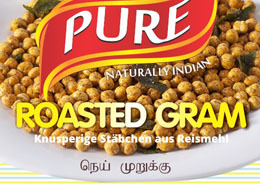 Best Quality Indian Gram cleaned and roasted in vegetable oil in a mix of Turmeric and Salt.Any time crunchy snack. No preservatives. Best quality peanuts roasted in vegetable oil. 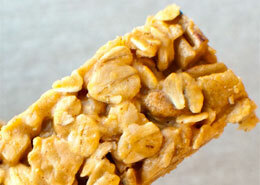 A crunchy nut flavored with chilly powder and salt. 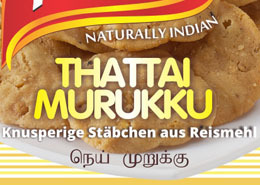 Its a traditional Indian snack goes with Cocktails. Zero chemicals. 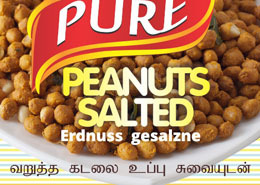 Best quality peanuts coated with a paste of Gram Flour roasted in vegetable oil.A crunchy nut flavoured with chillypowder,asafetida and salt.Its a traditional Indian snack goes with Cocktails or tea time. Another special South Indian crunchy snack made out of Rice flour and black lentil seeds added with split roasted gram Dal fried in refined vegetable oil. 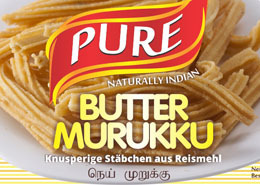 The mix of this snack is softened with the presence of butter. Salt, spices, Asafoetida and chilly powder are added to taste. This is a medium hot snack and suitable for any occasion including cocktails. Traditional South Indian crunchy snack made out of Rice flour and black lentil seeds fried in refined vegetable oil.The mix of this snack is softened with the presence of butter.Salt and a tinge of spices added to taste.This is non hot snack as chilly is not added at all.This snack goes zero chemicals. Traditional Indian sweet snack which could be offered at tea time or at any other occasion.This snack is made of best quality peanuts flattened in a mix of Jaggery (Raw Sugar taken from sugarcane) and Cardamom with an extra sweetening with Sugar.This sweet snack can go well with your chat times or the snack box of your children at school.There are absolutely no chemical ingredients. 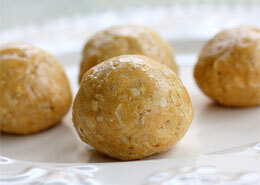 Traditional Indian sweet snack which could be offered at tea time or at any other occasion.This snack is made of best quality peanuts rolled in a mix of Jaggery (Raw Sugar taken from sugarcane) and Cardamom with an extra sweetening with Sugar.This sweet snack can go well with your chat times or the snack box of your children at school.There are absolutely no chemical ingredients.